TRECCIA is a contemporary twist on the classic chain design that is so popular. Select TRECCIA in Moonlight White * Moonlight/Parchment * Moonlight/Skyline Silver * Parchment *Skyline Silver Custom made to order in Italy by Dea, shipment is 6-8 weeks from order date. 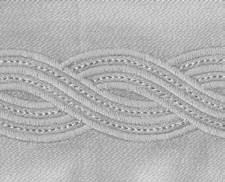 TRECCIA embroidered bedding may also be combined with TRECCIA matelasse coverlet and shams (white, almond, grey). Treccia Queen Flat Sheet 94" x 114"
Treccia King Flat Sheet 114" x 114"
Treccia Queen Duvet Cover 88" x 92"
Treccia King Duvet Cover 104" x 92"